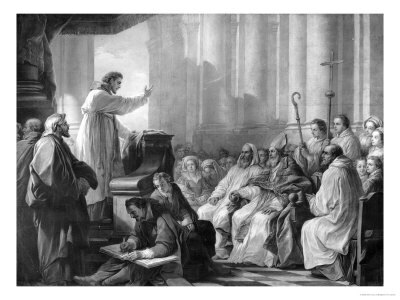 “this is the secret of Augustine’s enormous power as a preacher. He will make it his first concern to place himself in the midst of his congregation, to appeal to their feelings for him, to react with immense sensitivity to their emotions, and so, as the sermon progressed, to sweep them up into his own way of feeling. He could identify himself sufficiently with his congregation to provoke them to identify themselves completely with himself” (248). I think there is an interesting lesson for preachers here: your audience’s ability to enter into the thoughts and feelings of your sermon is related to your ability to enter into the thoughts and feelings of your audience. You must connect to them, feel with them, engage with them, etc., if you expect them to engage with you. Don’t expect interest from them if you don’t show interest in them. “the huge pressure built up by the need to communicate will do nothing less than sweep away the elaborate scaffolding of ancient rhetoric. For, as Augustine came to see it at the end of his life, rhetoric had consisted of polishing an end-product, the speech itself, according to elaborate and highly self-conscious rules. It ignored the basic problem of communication: the problems faced by a man burning to get across a message, or by a teacher wanting his class to share his ideas. Immediacy was Augustine’s new criterion. Given something worth saying, the way of saying it would follow naturally, an inevitable and unobtrusive accompaniment to the speaker’s own intensity: ‘the thread of our speech comes alive through the very joy we take in what we are speaking about'” (253). “Give me a man in love: he knows what I mean. Give me one who years; give me one who is hungry; give me one far away in this desert, who is thirsty and sighs, for the spring of the Eternal country. Give me that sort of man; he knows what I mean. But I speak to a cold man, he just does not know what I am talking about” (377).